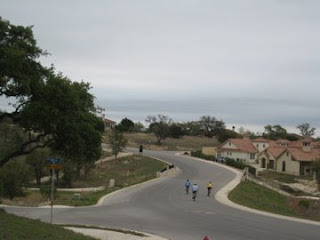 Last winter, Shelly and I ran on the Scenic Loop every weekend when we were training for the Austin Marathon. 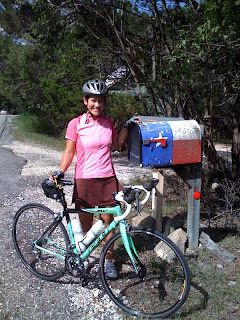 Every time we ran it, I would point out a mailbox that is painted with the Texas flag, and I would say, "Hey, you know what would be cool? We should get Robert to take our picture running past that and then submit it to Runner's World as one of those two-page spread photographs of fabulous places to run." And Shelly would agree. And then we would laugh because we always had the same conversation every time we passed that mailbox. Thanks, Shelly, for taking the photo! After that ride, we went shopping for a new bike for Shelly. And after she purchased her fabulous new bike (Chloe), we went for a second ride that day, just so she could give it a try. Felty* and me in the rain, approaching the finish line. They don't cancel triathlons due to rain. It rained off and on the entire time yesterday at Gator Bait. All my stuff is still drying out right now. I think Shelly and I both had great confidence going into this race because it was held in the same place that we practice every weekend. We swam from a different part of the lake than where we usually train because of the water levels; it was a triangle course around 2 buoys. There were 4 or 5 waves of swimmers and Shelly and I started dead last in our wave. But! We swam pretty much side-by-side the entire time and exited the water together, finishing the swim in the front of our wave. I can't believe I was 3rd place in my age group on the swim! Later, we found out that the swim course was long by 100 extra meters. Because the swim was in a different section of the lake, we ran next. Shelly and I got to run together too. We pushed each other through a very quick (for us) 4 miles. It started raining on the bike segment. Thankfully, they shortened the course due to wet roads, so we didn't have to do the monster hill at the turnaround. On the way back, I battled it out with another girl in my age group (I knew she was in our group because she passed us on the run...grr). We passed each other a couple times but I picked it up on the way into the park and crossed the finish line first. She finished right behind me, and behind her were 2 other women in my age group. Hooray! It was really weird finishing the race on the bike. We had to dismount and walk across the finish line with our bikes. We enjoyed post-race sausage wraps, Cheetos, and cookies. And then, to cap a fantastic morning, Shelly won the grand door prize! She got a free pair of Newton shoes from Tri-Sition Area. Even in the rain, it was a wonderful race day. *Yes, I renamed my bike Felty. It just fit better than Eisenheim the Magnificent. This morning was the last practice session out at Boerne Lake before the Gator Bait triathlon next week. A few people chose to try running before biking today because of the way the race is set up, but I decided to do the traditional workout instead. Stubbed my toe on a rock on the way into the lake. Worried the whole swim about whether it was bleeding (it wasn't). Got into a good rhythm and my stroke felt great after correcting using the thumb-to-thigh drill earlier in the week. I was even good at sighting! Took off with a group of riders who went out the gate at 20+ mph and left me behind. I caught up to them on the hills though. Struggled up the big hill (see it in the handy video posted below! ), but it wasn't as bad as the last time I did it. The first half of the bike ride was at 13.9 mph pace. Took a gu and turned around, flew down the hill at 38 mph and brought my avg speed up to 15.9 mph on the second half with negative splits. I was happy with a 10:15 pace to start, but after a giant fox ran across my path and scared me at the end of mile 2, I picked up the pace and finished my last mile in under 9 minutes. Once I got started, I just couldn't stop. What a great workout! I'm a little nervous about the tri next weekend. I hope I can still ride the bike after using up my legs on the run. Shelly and I are famous! And by famous, I mean we appear in a video on YouTube, of course. 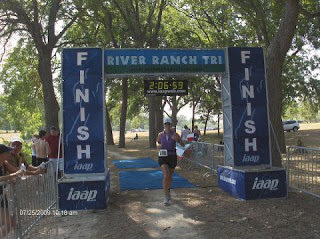 Here's the course video for the bike segment of the Gator Bait Triathlon that is coming up in 2 weeks in Boerne, TX. We'll be swimming, biking, and running on our home turf - the place we work out every Saturday. That's how we got captured on video (start watching for us around 1:56 - Shelly is in purple and I'm in pink). The twist? 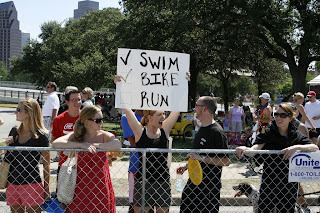 This year, the triathlon will be a swim, run, bike event instead of swim, bike, run. And, due to low water in the lake and possibility of bacteria present, there may not even be a swim. I swam across Boerne Lake yesterday! 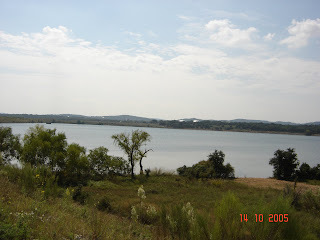 Every week at the Tri-Sition Area training at Boerne Lake, there's the choice of an 800 meter swim or a 1600 meter swim. I've always done the 800 meter swim, which is from the boat dock to the point and back. There's something totally scary about swimming all the way across the lake and back. I mean, when those swimmers are on the other side of the lake, you can barely even see them from the boat dock. That's a long way. Shelly, Robert and I went out there yesterday to do our workout - I planned to swim 800 meters, ride 14 (up the terrible hill for Gator Bait Tri training), and then run 3.5 miles. Robert joined us for the bike. Shelly hadn't been out there since before CapTex in May - I couldn't believe it! When we arrived and started getting ready to get in the water, I ran into my new friend Ernest, who is always out there training on Saturdays. He asked me if I was going to be swimming across. I said no, and then he told me he was and peer pressured me into doing it too. It didn't take much to convince me to do it. I had been putting off the inevitable - I knew I had to be able to swim 1500 meters in open water for the Olympic tri I'm doing in October. I had it on my calendar to swim across Boerne Lake two weeks from now. I was fine on the way out. The swim was kayak-supported and Ernest was always there to my left. He noticed when I paused and asked me if I was okay. And I was fine; I took a couple of breaks to do breast stroke and look around. I settled into my swim and when we reached the other side, only 17 minutes had passed. It felt like an hour. Especially in the middle of the lake; I felt so far away from everything. When we turned around to go back, I had a scary encounter with a stump that I saw protruding up from the lake bottom. I guess the lake is so shallow these days that tree stumps are something that you need to be looking out for. I freaked out a little bit and swam around it. Other than that, the swim was fine. My fabulous new shaded TYR goggles took on some water and fogged up, but that was okay. They also shielded my eyes from the sun and allowed me to see way better than my old goggles. I swallowed water a couple of times, and felt so nervous about sighting on the way back that I did a fair amount of breast stroke. But...at the end of the day...I swam a mile in Boerne Lake in 36 minutes. Hooray! The bike (12 miles - Robert and I turned around before the hill and let Shelly struggle up it alone) and run (4 miles - Shelly and I got carried away) were great too. I feel a need to describe how much I love working out at Boerne Lake and how much I love my bike, but I'll save it for another day. I fought an old lady today. When we arrived at the pool, Shelly and I happily found one lane available. This never happens. We always have to wait at least a few minutes to get a lane. We split the lane and warmed up, then did our first 400 and stopped to rest. As we paused at the wall, a woman got into the pool, and lingered in the lane next to ours (which was being used by a swim teacher and some little kids). She asked Shelly, "are you guys swimming? I just wanted to get across and I don't want to get in your way." I took that to mean that she wanted to cross our lane into the one on the other side (which was populated by two slow lap swimmers). I said, "oh, go ahead." And felt relieved that she was going to share that lane and not ours. She said "thanks" and moved into our lane. And stayed in our lane. And then just sat there in our lane, bobbing up and down about three yards from the wall. Shelly and I looked at each other in dismay. We decided to try swimming around her, but she was all over the place. After Shelly and I nearly cracked heads trying to pass her, I stopped and told the woman that I hadn't understood that she wanted to use the lane we were in, and that it wasn't working, could she wait 15 minutes while we finished our set? She got angry immediately and told me that she wasn't aware that the lane was reserved and that she'd talk to management. I agreed that I'd like to talk to management too, and that Shelly and I were there first. Ugh. If you know me, you know I hate confrontations of any kind, but if there is one thing I will fight about, it's my workout. I waited all day for this and you are not going to ruin it, lady! I asked the woman if she could at least stay on one side of the lane, and she growled that that would be fine. For the remainder of our workout, the woman stayed at the wall on one side of our lane, bobbing up and down and feebly kicking her feet in place every once in a while. I made sure my flip turns at that end of the pool were extra splashy. Shelly and I have several races planned for 2009. We're working toward the big goal of finishing the San Antonio Marathon with a respectable PR in November. We decided to train with San Antonio Fit instead of trying to work out a training plan by ourselves; running with a group every Saturday for 25 weeks should make running in a crowd and pacing ourselves easier on the day of the race. We're mixing in a lot of triathlon training this summer too. We're training towards our first Sprint in September and our first Olympic in October. If we like the Olympic, we'll do that distance at CapTex next spring and if we still like it...we'll plan to train for the Longhorn IM 70.3 for 2010. Now that I've put it in writing, it's kind of exciting and scary at the same time. We're three weeks into marathon training and I'm already tired. Shelly and I did our third run with San Antonio Fit this morning. Although we'd been placed in the yellow group based on our time trial time, we chose to run with the slower red group this morning because my knees have been bothering me all week. We had a really nice run with the red group and stayed right around a 10:40 pace for the whole 5-mile run. The run was great even though the weather wasn't (80 degrees and crazy humid outside - hello, summer). After the run, I headed to HEB to pick up some sodas to take to our company picnic today. The lady at the checkout counter asked, "Did you go for a run this morning?" My red face and wet hair and clothes must have tipped her off. I said yes and apologized for being stinky. I'm just excited that someone assumed I'm a runner based on my appearance. Is that weird? Hooray! 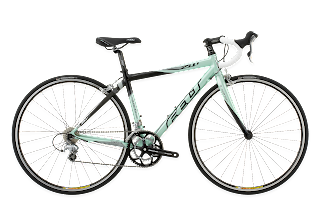 I want a new bike so badly! 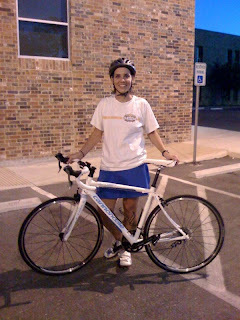 Shelly and I did the evening ride at Tri-Sition Area tonight, and we each got to try one of the store's demo road bikes. The only thing I can compare it to is when I traded in my Mustang for my Z3. They're both called sports cars, and they both look really cute, but they are worlds apart when you get behind the wheel. That's how I felt on the bike today. Riding was effortless, switching gears was ridiculously smooth and easy, and my legs didn't even feel tired when we were finished. Lorena taught me how to get in the aero position to save energy going down a hill — and all I could think of was the effort I expended pedaling furiously all through the CapTex on Monday. Imagine how much easier the run would be after an easier time on the bike...I need a road bike right away! Can't wait to go shopping for one. The one I rode today was $2400 — way out of my price range. I hope I didn't get spoiled on my first try. I'm going to take my time and find the perfect bike. In the meantime, if anyone wants to buy a barely used 2008 Trek FX 7.2, you know how to reach me (poor little Trek, never had a chance). Shelly and I did the CapTex Tri yesterday. The event features three distances: Olympic, Sprint, and "First Tri," which is the one we participated in. It was our second triathlon, but our first in open water. Our event started at 10 a.m., but the transition area opened at 7:30. After a good breakfast (bacon, egg, and cheese bagel! ), we headed over to the transition area, got body marked, and set up our gear. Then we waited. We watched waves of swimmers from the other races starting their events. The waiting around made both of us nauseatingly nervous! 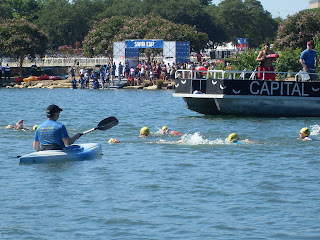 When it came time for us to start the race, we gathered on the shore of Town Lake in our color-coded swim caps as the announcer explained the course. Then we unwillingly jumped into the heart-stoppingly-cold river (~66 degrees) where we had to tread water for 3 minutes before we started the swim. Shelly and I might be two of the little yellow caps in this picture. I was proud of my first few strokes. I put my face in and swam freestyle like a champ. Then my goggles started leaking, I got kicked in the head, and someone touched my foot from behind. 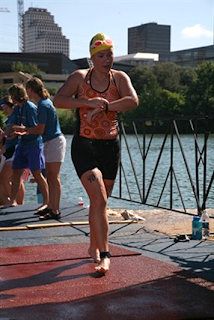 I freaked out and finished the rest of the swim doing breaststroke because I could not put my face back in the water. Ridiculous. Happiest moment of the morning. The trek from the lake to the transition area was a long one. I shuffled to my bike and got ready to ride as quickly as I could. It still took me just over 5 minutes to get in and out of the first transition. No, wait, this was the happiest moment of the morning. The bike ride was fantastic. I felt strong and wanted to see how fast I could push myself. I ended up riding at an average of 16 mph, which I was really pleased with. I passed a lot of folks and a lot of people passed me. The bike portion was so much fun because of all the activity around me and the speed at which it was happening. 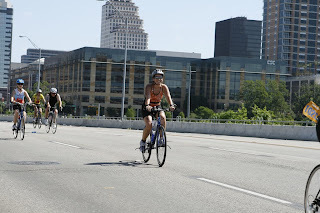 It was also a fabulous course around downtown Austin. Then I started the run. By that time I guess it was about 10:45, and it was getting hot outside. The sky was clear and the sun was beating down. I thought the run would be my strongest part of the race, and the speedwork I had done made me think I'd run 8:45 minute/miles, but my average turned out to be 10:13. It was just so hot. I picked up the pace in the last mile but it was too late to make up for time lost. I wonder if pushing it so much on the bike significantly weakened my run. I can't wait to go shopping for a road bike. Hooray! Crossing the finish line (I'm the orange figure under the banner). Overall, I'm really happy with how I did. I finished the race (400 meter swim, 6.2 mile bike, 3.1 mile run) in 1:15:15. I came in 34th out of 119 women who competed, and 115th out of 284 total participants. Shelly did great too, and both of us are really excited because we have so much room to improve. We could really do well at this! CapTex was a great experience and I'm definitely going to do it again next year — maybe the Sprint, or the Olympic if I'm feeling brave. This sign made me smile during the race! I've wanted to do Beach to Bay ever since I started running. I have brightly colored memories of this race from when I was a kid in like 1987, cheering for my dad and his corporate team. I remember the pre- and post-race parties, the free-flowing beer, and the good times had by all. But even though I've been a runner for 10+ years now, I've never participated. This year, Shelly and I surprised ourselves by saying "yes!" when Bobby from work asked if we wanted to take the 2 remaining spots on one of his teams. Bobby coordinates several Beach to Bay teams every year, and the last couple of years, he's asked me if I wanted to run. There's always been a reason not to. This year's reason was that CapTex is just one week after Beach to Bay, but Shelly and I decided to do it anyway. About a month before the race, our team captain dropped out, and I became the default captain. To our delight, Stephanie agreed to fill the spot as our 6th runner. Stephanie, Shelly, and I started planning a fun girls' trip down to the coast for the race. We didn't know the other 3 runners on our team; they were Bobby's friends' wives, or something like that. The ride to the coast was super fun! We took the day off on Friday, crammed all our stuff into Shelly's car, and gossiped our way to Corpus Christi. I don't think there was even one minute of silence during the 2 1/2 hour car ride. When we arrived, we found our hotel (nice), went to get lunch (Chilis, delicious, we were starving), went to a Target to get supplies (water and bananas), got sidetracked at a James Avery (each of us bought jewelry; I bought a cute pair of tiny flower earrings, which are now my "lucky race" earrings), and attended the expo (it was tiny, but there were cute pets for adoption!). Intermittently, we talked and texted with Bobby about planning for the race the next day. Let's just say that organization was not the name of the game this weekend. We never met the other 3 team members. We were on our way around Corpus at 9:45 p.m., scoping out the drop-off and pick-up points when Bobby called to say that they were going to dinner. We were tired and went to bed by 10:30. I hear that the rest of our team stayed up til 2:30. I think jello shots were involved. We got up at 4:30 to get me to the shuttle for the first leg by 5:30. The race started at 7. I had the first leg, Shelly had the fourth, and Stephanie had the fifth. I got on the shuttle out to North Padre Island. It dropped us off at a beach in the dark. Groups of quiet runners walked towards the beach, and I followed. I met a few nice ladies in the line for the restroom, but otherwise, I was alone and quiet in the crowd. It was weirdly peaceful and I felt very calm. The race started as the sun was coming up. We ran 2 miles out and 2 miles back along the water on the sand. As the race started, I aimed for an 11:00 min/mile pace, because I wasn't sure what it would be like to run on sand. But it was fine, and my pace steadily improved. To my surprise, I started passing people consistently starting around the half-mile mark. Tons of people stopped to walk, people who didn't look like they'd have to. I felt strong running. It was hard having to look at the ground the entire time, especially with the beautiful scenery around me. But I was afraid I would trip and fall on the sand. There were holes and dead jellyfish to dodge, and even a washed-up dead stingray. Gross. I had negative splits and finished my leg in just under 41 minutes. However, it took me 2 minutes to find my teammate (who I'd never met before) in a makeshift chute in deep sand that was full of runners looking to pass the baton. I also saw Art Avila in the chute. I don't know how he recognized me in all that chaos, but it was nice to see him, and after I finished I circled back to say hi. Then he took off running. The rest of my morning was spent waiting. I waited in line for a shuttle (1 hour). I sat on the bus and waited to arrive back at the HEB where Shelly had parked the car (2.5 hours). Then, I waited for Shelly to arrive at HEB after her leg was finished (30 minutes? ), and we waited in traffic while we went to pick Stephanie up from her leg (I have to say it was another hour). We were exhausted when it was over, but not from running! We picked up Stephanie, decided to skip the post-race party, and headed back to San Antonio after a stop at a Subway for lunch. I looked up the race results before I started writing this entry, and our team wasn't listed. I guess our 6th runner either didn't make it to the finish line or got disqualified. Sigh. The race was kind of a disaster, but my run was really good. I enjoyed hanging out with my friends on the trip. Shelly and I talked all the way home in the car about our plans for the next couple of years. But that's another post. 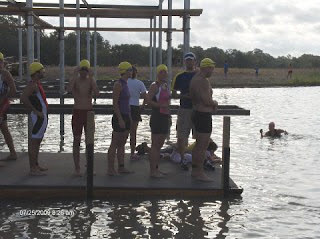 Shelly and I joined a training group from Tri-Sition Area to swim at Boerne Lake this morning. It was the first-ever open water swim for both of us, and our only opportunity to try one before CapTex in 2 weeks (unless we want to try swimming in the Gulf of Mexico when we're in Corpus Christi for Beach to Bay next weekend, but that is not happening, sharks). There were tons of people at the lake when we pulled up at 6:51 a.m. A Team in Training group was there, and at least 2 other groups were there. Everyone else had also brought their bikes to practice a swim-bike brick. But Shelly and I were just there to swim, and maybe to run. We were both very nervous about swimming in open water. I heard from lots of folks about how, no matter how much you want to and know you should, you may not be able to stick your face in the water. How true that is! We swam 400 meters out to a sandbar and then 400 meters back, and in the first 400, every time I tried to put my face in the water, it bounced right back out. I guess I was afraid of not being able to breathe, not being able to see, not being able to touch the bottom, being surrounded by green water and nothing else...it was pretty impossible to swim with my face in the water. But on the way back, I forced myself to try again because I knew I wouldn't have another chance to do it before the race, and managed to get my face in the water for a few strokes at a time. At least I know I can do it and not drown. Maybe I'll be better at the race. Shelly did great. She was way braver than me about putting her face in, and she was able to swim much more efficiently because she did that. We were told that wearing wetsuits would help too, but it seems like a lot of trouble and expense for a little 400 meter swim. The water was warm enough, and I think we'll be fine at the race. Each 400 meter leg took about 9:30. And hey, we just swam double the distance of the race in open water! After the swim, we put on our running shoes and went for a run. We meant to run maybe 2 miles, but the weather was nice and we were feeling good, so we ended up running 5. The people passing us by on their bikes were really friendly and supportive. We ran along the frontage road of I-10 and got honked at by an 18-wheeler, which made us giggle. Then we walked one mile back to the car as a cooldown and more time to chat. Talk about a confidence-boosting activity. We're both feeling much more at ease about the CapTex. But before that, we've got Beach to Bay next weekend. Woo hoo! I thought I'd like triathlons, but I didn't know I would love my first one as much as I did. The Windcrest Freshman Tri was the most fun I've had racing in a long time. I punched that race in the face...and I'm officially addicted! Designed for beginners, the event was made up of a 200-meter snake-style swim, a 10-mile bike ride, and a 2-mile run. It was organized beautifully by the race director, who explained all the rules before we started. He talked about how it was okay to stand up in the pool as long as you didn't move forward at the same time. He explained how you can't draft off other people on the bike, and that drafting means that you're closer than 3 bike lengths behind the bike in front of you. You can't ride your bike inside the transition area. Breaking the rules would result in time penalties and then disqualification. Snake-style swim means we got in at the left end of the pool and swam up and down each of 4 lanes, ducking under the dividers, until we got out at the right end of the pool. One swimmer started at a time. Participants were seeded according to a time we'd indicated on our entry form. Shelly and I had both put 4 minutes as our time, and I guess that's the time that most people wrote down, because I was #38 and Shelly was #70. Everyone between us also expected to complete the swim portion in 4 minutes. The pool swim was crazy. A swimmer left every 8 seconds. The pool was churning with bodies, and people were bumping into each other as they traveled up and down the lanes. At one point, the girl in front of me stopped, so I stopped in confusion, and the man behind me swam right over me and kept going. I finished the swim in 4:53, and walked slowly to my bike, catching my breath. 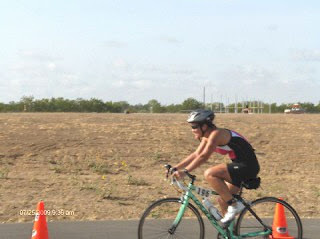 My transition to the bike was slow; my time of 2:33 was second-to-last in my age group. I made sure my helmet was the first thing I put on, and I got into my shoes without any issues. I pulled my bike off the rack and jogged it over to the line where I could get on the bike and start riding. Then, I followed the people in front of me, hoping that I wouldn't get lost. I didn't have to worry because there were plenty of volunteers on the course to point me in the right direction. The bike portion was 2 loops. Our training rides had been at an average pace of around 10-12 mph, so I went into the race thinking that that my bike ride would last about an hour, and that the entire race would take around an hour and 15 minutes. When I was deep into the second loop, I was totally surprised to look at my Garmin and see that only 25 minutes had passed. I finished the bike ride in 37:54. My second transition was second fastest in my age group (36 seconds - certainly made up for the first transition!) because all I had to do was take off my helmet, hang up my bike, and start running. I felt all wobbly on jello legs running out of the transition, and I saw a few people ahead of me on the road to follow. The first mile of the run was a gradual uphill. I passed a couple of people, which gave me enormous confidence. I kept looking at my Garmin, thinking, wow, I could finish this race in one hour! I had negative splits and finished the run in 17:26. I finished the race in 1:03:27. I came in 8th out of 18 racers in my age group and 87th out of 176 participants overall. See the full set of race results here. I hoped to do well, and surpassed my expectations. It was amazing to get out there and really see what I could do. And we just started all this about 2 months ago! I've been smiling all day. 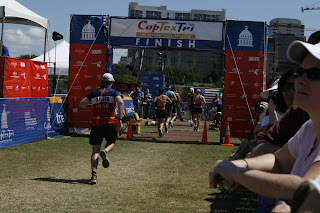 Shelly did well too, and we're both excited to do the Capital of Texas Tri in Austin in 3 weeks. 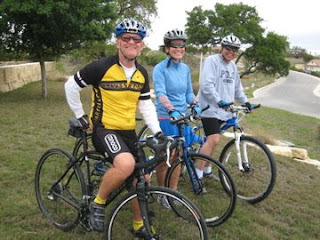 Two Sundays ago, Shelly, Robert and I cycled around the UTSA campus. Last Sunday, Shelly and I ran around UTSA. For two Sundays in a row, we've headed straight to the Flying Saucer for bar food and beers afterwards. I love triathlon training! We're supposed to be recovering from the marathon for a few months by training for a triathlon. That's not exactly what's ended up happening, but I'm happy to be doing what we're doing. I suppose we are resting from running, because our plan is to run no more than 15 miles per week. But we're training 7 days a week now (only 3 of those days are running, though), we're doing speedwork, and we've signed up for a ton of races! We've got a race every weekend in May. The most recent race added to our list is the Beach to Bay marathon relay in Corpus Christi. Six team members split a marathon, and there's a huge party afterwards. I remember when Dad and his friends used to do this race back when I was a little kid, and I've always wanted to do it. This will be my first time. Our team name is the Bay-Gulls (Why don't seagulls fly over the bay? Because then they would be bagels...) and I've become the captain by default. Shelly, Stephanie and I are making a girls' weekend out of it, and we're running with three other girls that we don't know. I think it's going to be great! Shelly and I had a GREAT RUN after work on Wednesday! I've been sick or allergic to oak pollen all week, and I had a headache before we started the run. Shelly agreed to stay close to the building in case my headache got worse during the run, and we ran 3 laps around the perimeter road at work (1.2 mile loop) rather than doing an out and back like we usually do for 4-milers. After a lovely run (negative splits! ), we walked and talked around another loop, and before we knew it, it was 7 p.m.! It felt just like old times; Shelly and I chatting happily about our race goals while on a run/walk. We talked through some of our feelings about the marathon. It has already been a month since the race, and I'm starting to feel better about it. Shelly is too, and I'm really glad to see it. Two days after the marathon, we both declared that we'd try again in November, but I'll admit now that I didn't feel very inspired to really do it. The thought of spending all those hours training, being tired and throwing out yoga and cross training, feeling fat and squishy from logging hours of slow runs, just to be demoralized again at another marathon, seemed almost too much to contemplate. But now we've started talking about training for the Rock n Roll Marathon, and I know we'll be able to do it. At least we'll do better than last time. What better place for vindication than our home town? And then we'll race the Austin half marathon. After training for a marathon, it's obvious to me that we can dramatically improve our half marathon PR, and I'm really excited to try it. That will all start in August. Until then, it's triathlons, fun runs and relays, and maybe a hill country bike tour. 2009 is starting to look like a lot of fun. It's about time! I ran five miles today with Shelly and our co-worker, Justin. It's only the second time since the marathon that I've run five miles, and it's the longest I've run since the marathon. It didn't feel good today, but it made me happy. I had some weird tightness in my hamstring and soreness in my shoulder, which means I was running tense. Towards the end of the run, I got a stitch in my side. But I ran five miles at an average 10:26 pace. Not too shabby! It's a run that I'm proud of. I'm relieved to know I can still run more than two or three miles at a time. It's really weird to switch gears and get into triathlon training. It's totally foreign to only be running two or three times a week. The only reason we ran five today was to avoid thunderstorms tomorrow, so we turned today's four-miler into five and we're skipping the run tomorrow. I think it was worth it. I'm worried about Shelly. She hasn't had a good run since the marathon. She's been having calf issues that cause her to have to stop and walk it out on nearly every run. I haven't been stopping to walk with her. I feel guilty about leaving my partner behind, but we run so infrequently now that I can't make myself stop to walk. Justin and I just keep on running, and he challenges me to run slightly faster than is comfortable after several months of slow-paced marathon training. I miss running with Shelly though. I hope she starts to feel better soon. Swimming and yoga tomorrow. Hooray! Shelly and I officially started triathlon training this week. 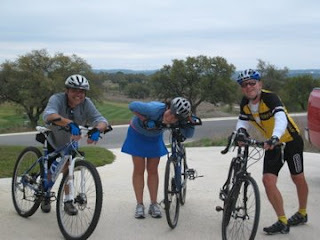 We're training for the Capital of Texas "First Tri" on Memorial Day, and we're going to do the Windcrest Freshman Tri at the beginning of May as a practice race. It's all very exciting. Shelly and I have a great plan (we think) - we're tri training through the spring. This is recovery after 9 months of base building last year that culminated in a marathon attempt last month. After the Windcrest Tri, we'll know if we like it or not. Maybe we'll pick another tri this summer to train for. Or maybe we won't really like it and we'll drop swimming and biking and start building our running base earlier for the marathon we're planning to run in November. I'm a newbie again for the first time in 10 years. It's a really weird feeling. I'm not a great runner, but I know how running works. I've read the books and the message boards and I've gotten advice from other runners, and I know how to sign up for a race and train for a race. I know what to wear. I know when to replace my shoes. I know how to do hill repeats and speed work and long runs and recovery runs, and I know why you do all those things. Now I have to learn all that stuff for triathlon, and it's kind of daunting. I've read a couple of books about triathlon training, and we got a 12-week training program out of one of the books. I have a book on swimming (Total Immersion), and we're using that to learn to swim. I'm not tired for the first time in 20 weeks. The first week of beginner sprint tri training is way easier than a marathon taper. I love swimming. It feels amazing to slip through the water, and I think I could be good at it. But I hate chlorine, and I hate putting on a swimsuit. I also hate shopping for a swimsuit, which I need to do because we're going to be swimming twice a week and I don't want to do a ton of laundry. I love spin class and I love to ride my bike. I especially love that bike riding involves Robert. It's so much fun to ride with him. I don't know how to practice swimming so I can prepare for a triathlon. I don't know how to practice riding my bike so I can prepare for a triathlon. I don't even know how to shift gears properly. I miss running. I went out for an extra unscheduled run on Saturday just to feel my legs move. I miss running. I don't think running three miles, three or four times a week, is going to work for me. I miss running. I want to go out and run 10 miles just so I know I still can. I miss running. I miss that feeling of satisfied tiredness that I have after I run long on the weekend. I miss running. I think I underestimated how running takes the edge off my anxiety. I miss running. I've got to figure out a way to get more running into this training plan. It's almost a month later already and I haven't written an Austin Marathon race report. By popular demand (i.e., Leslie's request), here it is. This was my first marathon, and it was 100% a learning experience. It was a disappointing (extremely disappointing) experience too, but upon reflection, it seems like anytime I undertake some big, meaningful endeavor (i.e., a giant race), it usually ends up being disappointing. Maybe I get my hopes up too high, or maybe I have unrealistic expectations for these types of things. Maybe I freeze up out of panic on the day of the big event. Maybe I'm too hard on myself... but for the half marathon it was true, and it turns out to be true for the marathon as well. Anyway, Shelly and I trained our hearts out and really enjoyed the training. During the 20 weeks that we trained for this race, I skipped only two runs. That's pretty amazing, and unprecedented for me. We ran two 20 milers with little difficulty; in fact, every long run we did over 15 miles, I felt like I could keep going afterwards and complete a marathon. Our plan was to stick to the 5-hour pace group and finish the race in 4:59:59. Miles 1-2: We went out too fast, trying to keep our pace group in sight. Miles 2-7: After finally catching up with our pace group, we struggled to find our groove. Miles 8-13.1: We settled into an 11:20 pace, running steadily over the hills. When we passed the turnoff where the half-marathoners went one way and we went the other, I became quite emotional. Wow, we're really doing it. We're going somewhere I've never been before. This is amazing. I had to choke back tears and had a little trouble breathing. Mile 15: We started to look for a porta-potty. When we stopped at the one at Mile 15, there was a line. We waited in the line for 5 minutes, which was just enough time for my calves and hamstrings to cramp up. After we left the porta-potties, I asked if we could walk to loosen up my legs. It was the first time Shelly and I smiled since the race started. Miles 16-20: Shelly and I walked a mile and then ran/walked the rest. Shelly was really not feeling well. We said we'd meet my family at Mile 20 and ask Dad if he thought Shelly needed to DNF and get a ride back with them, or if she could walk on to the end of the race. Miles 20-26: Mom and Robert walked us in to the finish. Mile 26-26.2: Shelly and I ran feebly across the finish line (6:01) and picked up our finisher's shirts and medals. It was pretty much a disaster, but it was a learning experience. After a day to think and cry about it, Shelly and I have decided to try again this fall at the San Antonio Rock 'n' Roll Marathon. In my secret dreams, in November, we are going to take an hour and 15 minutes off our marathon PR.